The same add-in and business logic works across desktop (Outlook for Windows and Mac), web (Office 365 and Outlook.com), and mobile. 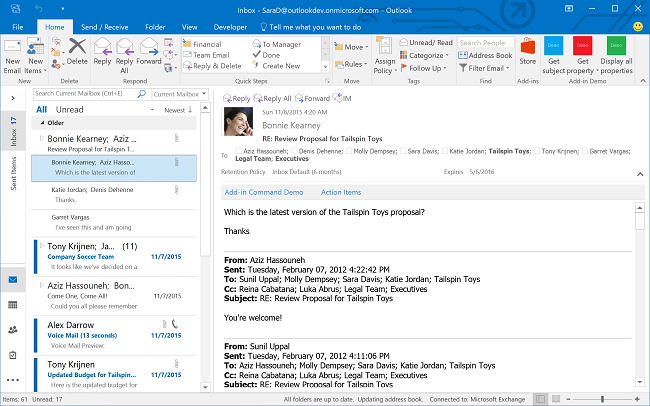 Outlook add-ins can be acquired from the Office store or side-loaded by end-users or administrators. The Outlook items that support add-ins include email messages, meeting requests, responses and cancellations, and appointments. Each Outlook add-in defines the context in which it is available, including the types of items and if the user is reading or composing an item. When you build your add-in, if you plan to publish your add-in to the Office Store, make sure that you conform to the Office Store validation policies. For example, to pass validation, your add-in must work across all platforms that support the methods that you define (for more information, see section 4.12 and the Office Add-in host and availability page). Add-ins can declare buttons that appear in command surfaces across messages and appointments. For more information, see Add-in commands for Outlook. Add-ins can link off regular expression matches or detected entities in messages and appointments. 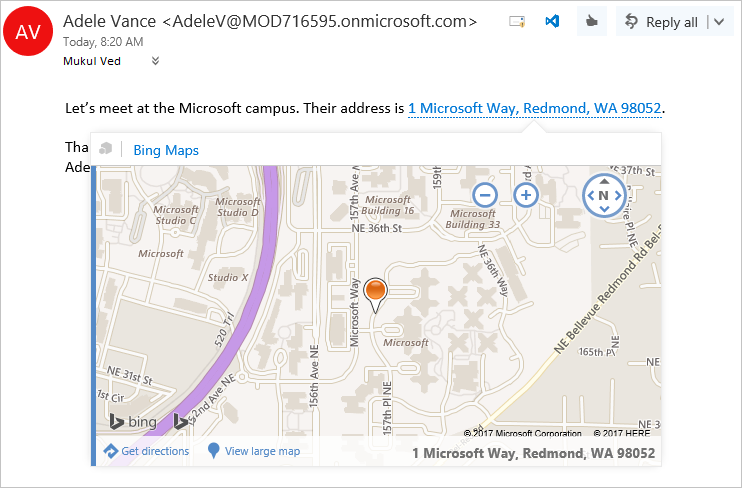 For more information, see Contextual Outlook add-ins. Custom panes have been deprecated so please ensure that you're using a supported extension point. Protected by Information Rights Management (IRM) or encrypted in other ways for protection. A digitally signed message is an example since digital signing relies on one of these mechanisms. A delivery report or notification that has the message class IPM.Report. *, including delivery and Non-Delivery Report (NDR) reports, and read, non-read, and delay notifications. A draft (does not have a sender assigned to it), or in the Outlook Drafts folder. A .msg or .eml file which is an attachment to another message. A .msg or .eml file opened from the file system. In a shared mailbox, in another user's mailbox, in an archive mailbox, or in a public folder. In general, Outlook can activate add-ins in read form for items in the Sent Items folder, with the exception of add-ins that activate based on string matches of well-known entities. For more information about the reasons behind this, see "Support for well-known entities" in Match strings in an Outlook item as well-known entities. Outlook add-ins are supported in Outlook 2013 or later for Windows, Outlook 2016 or later for Mac, Outlook Web App for Exchange 2013 on-premises and later versions, Outlook for iOS, Outlook for Android, and Outlook on the web in Office 365 and Outlook.com. Not all of the newest features are supported in all clients at the same time. Please refer to articles and API references for those features to see which hosts they may or may not be supported in. To get started building Outlook add-ins, see Get Started with Outlook add-ins for Office 365.